Nothing is too much trouble when I’m curled up in my easy chair. My sister calls and I offer to watch her dog for a week. I get an email asking me to eat and rate a couple dozen bowls of chili; yes, I’d be delighted. I phone a friend and, long story short, invite her to breakfast at my house the next morning. I pull a fuzzy blanket around me and snuggle in. The next morning I’m on my second cup of coffee when the breakfast invitation rises to the surface of the somnolent soup that is my brain at that hour. I shoot out of the chair like an arrow, lope to the kitchen and find a half-dozen eggs but no bread. Aw, geez. When the caffeine and adrenaline kick in at about 9 a.m., I remember seeing a pie crust disk in the fridge along with half a log of goat cheese. I throw together a quiche, perk a fresh pot of coffee and wait for Nancy to arrive. I wait. And wait. By noon the quiche has cooled down nicely and I’m wide awake. I’ve had time read the newspaper and I’m ready for lunch. Nancy finally sails in with a pot under her arm. She has brought cauliflower soup. I nudge her along as she melts butter, waits for it to brown and adds cauliflower florets. She’s messing around with a frickin’ garnish while I’m so hungry I could eat the dog kibble. We carry the bowls of soup and the quiche to the table and the three of us dig in. OMG. 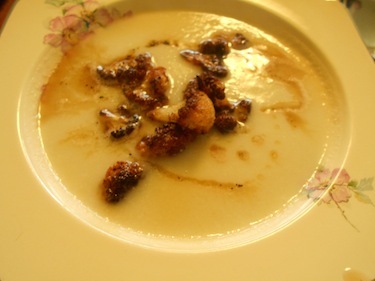 The browned cauliflower florets and the drizzle of brown butter MAKE the soup. They are a rich, gutsy counterpoint to the creamy cauliflower-leek puree. All is forgiven. I snap a photo and extract a promise from Nancy to email the recipe when she gets home. Nancy had jotted it down while watching an “America’s Test Kitchen” video, she says. The quiche is pretty good, too, by the way – delicate and pretty. But big deal, how can you mess up quiche? I find out the next day after Tony leaves for work. The remains of his lunch are on the kitchen counter: a plate smeared with quiche and a telltale blob of ketchup. OMG. Core cauliflower, then trim core to use in soup by removing the light gray-greenish band and thinly slicing the inner part of core. Remove and discard green leaves as you work. Cut off enough small florets to make 1 heaping cup. Slice remainder of the head into 1/2-inch-thick slabs. Set aside. Trim the dark-green part of the leeks, leaving the light-green and white parts only. Slice the white and light-green parts lengthwise and rinse out any dirt. Slice crosswise into thin slices. Slice onion thin. In a large saucepan over low heat, sauté onion and leeks in 3 tablespoons of the butter. Cook until soft but not brown, about 7 minutes. Add 4 1/2 cups of water, the sliced core and half of the cauliflower slabs. Bring to a simmer and cook for 15 minutes. Add remaining cauliflower slabs. Continue cooking 15 minutes (total 30) or until tender. In a medium skillet over medium heat, melt the remaining 5 tablespoons butter and sauté the heaping cup of reserved cauliflower florets until nicely browned. Remove to a bowl with a slotted spoon. The butter should be brown as well. If not, continue sizzling butter until the solids are brown. Pour into a small bowl or measuring cup. When soup has finished cooking, puree in batches in a blender until silken smooth. Wash saucepan, and return soup to heat. Bring to a simmer. Add water if necessary to thin it a bit; a spoon should briefly leave a trail when pulled through the soup. Season to taste with salt. Although coney dogs were invented in Michigan (no, not in New York at Coney Island), we have a coney tradition here in Ohio, too. Maybe the sauce oozed over the border in the early days of coney dogdom. I had one of the best local examples of the genre last week when a friend brought me two dogs from Lucky Dog in Hubbard. She stopped here on her way back from Youngstown just to prove that her favorite dogs are better than my favorite dogs. I agree. Lucky’s makes a fabulous coney dog. The grayish-brown sauce of finely ground beef has a mysterious but wonderful flavor that I chalk up to lard (probably) and allspice, cloves and a wee hint of cinnamon (maybe). In the finish I detected a trace of heat. I’m not sure about any of this, but the dogs were great. I ate them both, destroying the evidence so Tony wouldn’t know I stole his. The previous week I had treated my friend to chili-cheese dogs from The Hotdog Shoppe in East Liverpool, boasting that they’re the best in the state. They are indeed fab but let’s be clear: Chili dogs are not coney dogs. Coney sauce usually doesn’t contain tomatoes, and certainly no chili seasonings such as cumin. Now I’m in a coney dog state of mind. Anyone know of a great local coney dog (not your aunt’s) I can buy? I need a fix until I can get to Lucky Dog, which my friend tells me is mostly a drive-through that also serves downhome Hungarian foods such as chicken paprikas and cabbage rolls. If you go (here’s a map: http://www.restaurant.com/lucky-dogs-hot-dog-shoppe-hubbard-pid=208990), bring me back a couple of coneys. Do you have a favorite recipe for broccoli cheese soup made in a Crock Pot? Every recipe I look at is different — different cheeses, canned milk versus half and half, or using water instead of chicken stock. Thanks for your help. Dear Joanne: Broccoli cheese soup is not a favorite so I can’t help you. Maybe I just haven’t tried the right recipe. I hope someone will provide it after seeing your request. Your recipe for Katsudon sounds interesting but I searched in vain for the vegetable component. What veggies would you suggest and are they stir-fried or what? Apologies if the information is there and I overlooked it — been known to happen. Dear Leslie: Uh oh. I’m sorry, but vegetables are not part of the recipe. I wrote that part before I looked at my testing notes. Others do use vegetables in katsudon, though – par-cooked carrots, snow peas, asparagus, green beans or whatever. If you like, add them to the broth, cover and simmer until tender before adding the meat.